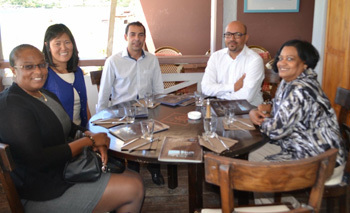 SIMPSON BAY, St. Maarten (September 29, 2013) - Management of the Princess Juliana International Airport (SXM), met recently with a delegation of the L’Esperance Airport in Grand Case, to further explore areas of synergy between the island’s two airports. On the agenda was, among others, the initiative of L’Esperance Airport, also known as Grand Case airport, to introduce a shuttle bus service between SXM and Grand Case. It is estimated that between 20 and 30 passengers would be transferred by the shuttle bus daily. The shuttle will operate between 8:15 AM and 7:15 PM. Parties agreed that the buses would be purchased by the Collectivité of St. Martin, while approval would be given by SXM. The initiative will be discussed with the respective airport taxi associations before it is implemented. Djouba disclosed that St. Barths dropped its flights by 30% of its total traffic due to increased use of ferry transportation. The director of the Grand Case airport updated the management of SXM about plans to extend its runway. Negotiations are ongoing for this runway extension to commence in the next two years. The plans are to re-route the road in the area to commence with the extension, however, the land being considered for the extension is not owned by the Collectivité but by a private owner. The Grand Case runway extension will result in the possibility of added aircraft services for the airport, Djouba said.